Profisee is a multi-domain enterprise master data management (MDM) software that provides a cost-effective and accessible approach to identifying and handling an organization’s critical data. Recognized as a fast-growing MDM vendor, Profisee allows unlimited users, records, and data domains, as well as various deployment options. A state-of-the-art architected platform enables integration and interoperability across an enterprise. Data connectors for today’s widely-used systems, including CRM, ERP and data service providers, are also available. Profisee presents a single code base platform for enterprise configurability, but without coding. The technology offers multi-domain MDM without compromising enterprise scale and capability. Profisee also boasts of a Profisee Academy, where MDM users can train and certify a team. Profisee makes master data management more attainable for business data stewards. This is with the help of analytics that provide feedback to governance for measurement of progress. Data administrators are given powerful tools for doing the right job for the right audience. Its Golden Record Management (GRM) engine is able to cleanse, match, and verify performance of records numbering in the millions. Data can be cleansed, verified, and de-duplicated. There are single views of customer, product, vendor, patient, provider, and more. Cross-application analytics provide 360° views of a business. These are some of the key value propositions for MDM. Profisee delivers the promise of GRM via industry leading technology and purpose-built stewardship. Profisee’s Event Management features empower users to trigger events based on changes to master data. These events can then be used for data integrations and workflows in real time, or send messages to other enterprise applications. Events can be generated by changes to data and posted to various channels. Profisee helps users build and maintain a central definition of metadata for MDM needs via MetaModel. 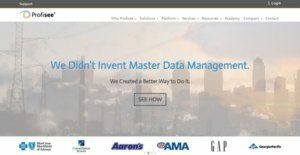 The solution provides business users with easy access and management of the definitions, descriptions, and associations that describe master data application. As a master data solution evolves, MetaModel automatically synchronizes metadata changes, ensuring stakeholders always have the most up to date information. If you are considering Profisee it could also be beneficial to examine other subcategories of Best Product Information Management - PIM listed in our database of B2B software reviews. There are trendy and widely used systems in each software category. But are they automatically the best fit for your organization’s unique needs? A popular software product may have thousands of users, but does it provide what you require? For this reason, do not blindly invest in popular systems. Read at least a few Profisee reviews and think about the elements that you desire in the software such as the cost, main features, available integrations etc. Then, shortlist a few systems that fit your wants. Try out the free trials of these apps, read online opinions, get clarifications from the maker, and do your research meticulously. This profound homework is certain to aid you find the best software platform for your organization’s unique wants. How Much Does Profisee Cost? Enterprise pricing for Profisee is provided upon requesting for a quotation from a sales representative. We realize that when you make a decision to buy Product Information Management - PIM it’s important not only to see how experts evaluate it in their reviews, but also to find out if the real people and companies that buy it are actually satisfied with the product. That’s why we’ve created our behavior-based Customer Satisfaction Algorithm™ that gathers customer reviews, comments and Profisee reviews across a wide range of social media sites. The data is then presented in an easy to digest form showing how many people had positive and negative experience with Profisee. With that information at hand you should be equipped to make an informed buying decision that you won’t regret. What are Profisee pricing details? What integrations are available for Profisee?